Implementing an agile and proper API security infrastructure is critical to protecting your apps and sensitive data. This white paper analyzes centralized and decentralized API security models, providing an in-depth look at the organizational impact and technical costs associated with each model. The benefits of centralized API security. 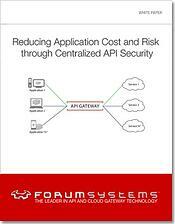 The role of an API gateway in centralized API security. How to determine the best security approach for your organization.